Subject: Dada Mail 11.2.0 Released! Dada Mail v11.2.0 brings changes to the Send a Message workflow, making it simplier, easier and more intuitive to author your mailing list messages, without removing any of the features you've come to depend in Dada Mail! Read more about these changes in the Dada Mail Blog. If you try to leave a draft message screen without saving your changes, you'll be reminded of this with a prompt. This should help stop you from inadvertently leaving the screen prematurely. 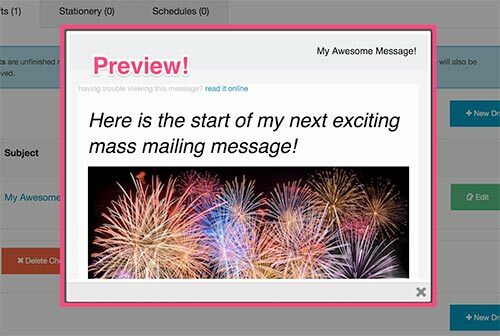 When you log into your mailing list's list control panel, the default screen is now the All Drafts/Stationery/Schedules screen, rather than the Send a Message screen. This is to make loading of the list control panel go a little faster, since the Send a Message screen is very complex, and takes a while to fully load. Having two screens that can send a mass mailing seems like one too many, so we've removed the Send a Webpage screen. Don't worry - all the features on that screen have been added to the Send a Message screen, so no features have been removed. What has been removed is a lot of duplicate code in the backend. Getting rid of this code makes things just that much more simplier to keep well-maintained. Individual Drafts/Stationery/Schedules now how a button to Preview the message, without having to open them individually for editing. All messages are now sorted by creation date, rather than last-modified date, and this creation date is shown. Drafts/Stationery/Schedules has been renamed, All Drafts/Stationery/Schedules and has been moved to the top of the Mass Mailing top bar menu. As has been mentioned, this is the defalt screen now when you log into your mailing list's list control panel. Many times, people would like to re-use a previously sent message for a new mass mailing. Now, Dada Mail has an option to save previously sent messages you've authored in the list control panel as new stationery messarges, which you can then use to create a new draft message from. Some users have reported problems with addresses they know are valid, but which that bounce anyways: there's a (hopefully) temporary problem on the receiving mail server. To counter this, Dada Mail now allows you to set up a list of addresses that the Bounce Handler will not process as it does usually. Instead, bounces from the addresses will just be ignored. Addresses can be added simonilar to the Black List and White List: segments of addresses are allowed. For example, if you want to ignore a specific email address, you can. If you want to ignore all address from a domain, you can do that as well. to receive 20% off your entire installation order. Get the support lifeline your organization strong with a Pro Dada Subscription. Not only does Pro Dada give you access to Pro Dada itself, as well as the Pro Dada Manual; being a Pro Dada Subscriber now gives you direct, prioritized support to the developers of Dada Mail through Zendesk. With over 18 years of experience helping people getting the most out of Dada Mail, we're here to make sure you're having the best experience when utilizing Dada Mail.